I'm such a bad blogger, I know. I haven't even posted about the meet-up on Saturday. And I feel badly about that. I do. But I've been totally consumed by writing this week's Seven Days cover story, Peace Talks. 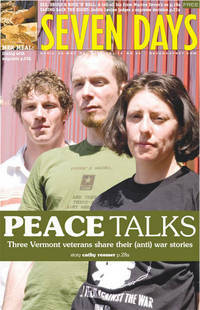 It's basically an interview with Drew Cameron, Matt Howard and Adrienne Kinne, three Vermont Iraq War vets who oppose the war. I saw them at a reading at the Green Door Studio on Saturday, and then talked with them at length on Sunday. I don't typically promote my own stories on my blog, but this one's an exception. I spent pretty much the whole weekend immersed in it, and I'm having a hard time getting it out of my head. But I guess that's the way it should be. After all, there is a war going on. And my tax dollars are paying for it. In addition to the story in the paper, I've also uploaded four audio excerpts from our interview to the 7D website. And thanks to Deb Ellis, I was also able to link to some video footage from the reading. Take a few minutes and check it out. Leave your comments about it on this post if you like. Sorry we're not yet able to offer commenting directly on our stories on the 7D site. Kudos to Andy Duback for the photos.